Working with the database is always an interesting task, while working with bigger projects, database is the mandatory resource why because without database applications will not exist. 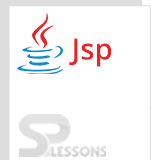 Before learning JSP database access developer should have knowledge in JDBC, MySQL or Oracle, Servlet, HTML. Already Splessons have discussed how doing the work with servlet database access, following is the link to see servlet database access. Servlet Database Access. Following is an example which describes the database connection with JSP. Following is an example which describes the JSP Database Access. Here first create the database as follows. Class.forName() is used to register the driver. DriverManager.getConnection() method is used to establish the connection. Here the developer is using MySQL driver to connect to the database and user name and password also setted. Here used Set and Get methods on the data members. Here created the text fields to enter the user name, password and also created register button. Here code will be compile from the index.jsp . When compile the program following is the output will be displayed. Where enter the details. When submit the details following is the message will be displayed. JSP Database Access – In this code MySQL database has been used so MySQL connector jar should be imported. JSP Database Access – The performance of the application will be faster if you use Prepared Statement interface because query is compiled only once.